Sean Wilson - Kampot Writers Festival 2017 "Courage" Kampot Writers Festival 2017 "Courage"
The Ottawa International Writers Festival runs from October 20–25, 2011. The festival began in 1997. It was Neil’s idea. He’d been Press Secretary to the Minister of Heritage and in traveling across the country and getting an inside look at Canadian culture he decided it was time to do something new and exciting here in Ottawa. Took me a few months to warm to the idea, but once he convinced me it was worth a try we just went for it. No market surveys or studies — not even a real business plan. Just a whole lot of enthusiasm and curiosity and a willingness to make it happen. Hard to believe 15 years later what a white-knuckle experience it was for the first few years! Not easy raising the cash to pull off something this ambitious, but we decided to go big or drop the whole thing. I still remember how amazing it felt to walk out on the stage that first night of the first festival — electrifying and humbling. For those unable to attend the first festival, it ran an unbelievable (and at times, exhausting) nine consecutive nights at the National Arts Centre and featured 35 poets, fiction and non-fiction writers from Ottawa and across Canada, including George Elliott Clarke, Stephanie Bolster, jwcurry and Yann Martel. The first year also featured 16 writers from Ireland, which was, at that point, the largest contingent of Irish writers performing outside their home country, including Robert McLiam Wilson, Michael Hartnett, Frank McCourt, John Kelly and Dermott Healy. 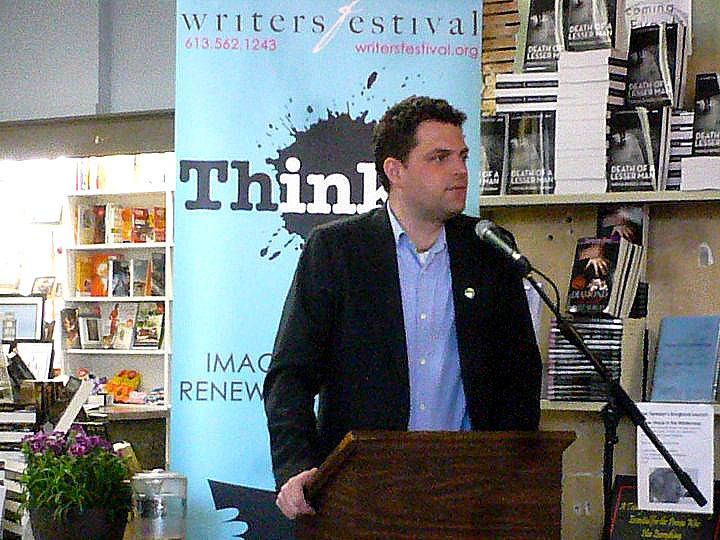 Over the years since, the festival has hosted some 500 writers and includes a list of some of the finest writers publishing in Canada and around the world: Jose Saramago, John Lavery, George Bowering, Adrienne Clarkson, Lynn Coady, Monty Reid, Dany Laferrière, Zoe Whittall, Jaspreet Singh, Diane Schoemperlen, David McGimpsey, Ken McGoogan, S.E. Hinton, Alberto Manguel, Damon Galgut, Bill Gaston, B.W. Powe, Anne Stone, Stuart Ross, Ian Rankin, David W. McFadden, Thomas Wharton, Lynn Crosbie, Stephen Brockwell, Daphne Marlatt, Erin Moure, Jasper Fforde, Ivan E. Coyote, Nicole Brossard, Helen Oyeyemi, Francis Itani, C.D. Wright, Margaret Christakos, Adeena Karasick, Susan Musgrave, John Newlove, Rob Winger, Robert Pinsky, Ken Babstock, Michael Cunningham, Nadine McInnis, Paul Quarrington, Anne Simpson, John Barton, Marcus McCann, Priscila Uppal, Colin McAdam, Wayde Compton, Elizabeth Hay, Elisabeth Harvor, Jonathan Bennett, Rebecca Rosenblum, Leon Rooke, A.L. Kennedy, Catherine Bush, Meredith Quartermain, Robert Kroetsch, Clare Latremouille, Austin Clarke, Meghan Jackson, Margaret Atwood and Michael Ignatieff, many of whom read to sold-out or nearly-sold-out crowds. Those of us privy to the Hospitality Suite during the sixth annual fall festival in 2002 might recall Ottawa writer/publisher/bookseller jwcurry’s residency in the back room, printing all night, all week, with his hand-cranked gestetner. Supplied with paper by the festival, curry produced the beautiful and unique hand-sewn publication Guessed Book(Ottawa: A Onion Primtsmop, 2002), a collection of single-page pieces by anyone at the Hospitality Suite — from writers to friends to festival staff — willing to mark up a gestetner sheet. 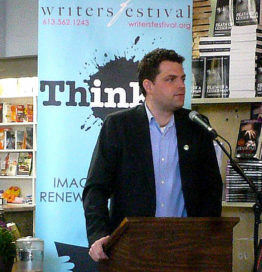 The prior festival had existed through chaos, on the immediate heels of September 11, 2001, with a number of writers unable to make it to Ottawa. In the case of the Welsh band who performed at the opening night ceremonies, they were unable to fly home, trapped in Canada for days longer than expected. The UK writer John St. John, author of a first collection of short stories and invited to read at his first festival, spent 24 hours at Heathrow for the sake of making it, finally, to Ottawa to read. The heightened emotion and sheer confusion of the events in New York and Washington made the forum essential for many of the participants, and for just as many, it was essential to remain where they were. Most of the writers who could not make it were able to re-book festival dates weeks or months later. Our 5th anniversary festival opened on Sept. 12, 2001. That was a wild year with writers trapped in airports all over the world and a major sense of uncertainty in the air. The festival, of course, went on. I’m still so grateful we were able to spend those first few post 9/11 days in the company of writers and the community. It saved me from the CNN loop that caught so many and offered a chance to really talk things through with some remarkable minds. About a third of the writers couldn’t make it and a bunch of the events were cancelled, so we ended up about $20k short for the year. Rather then heading to government funders with hat in hand for a bailout we decided to go straight to the community and started running year-round events. The year-round events were successful enough to get us out of debt within a year and were popular enough that we kept them going. We started the twice-yearly festivals in 2004. The appetite for literary programming was growing and we just couldn’t keep expanding the fall edition, so we took a gamble and went for two a year. And it’s been amazing. So much better to spread things out over more time and to ensure that we get the authors when the books are first hitting. It’s an insane amount of work — there’s really no down-time except the Christmas holidays — but the audience loves it and I love how fresh the programming always feels and enjoy having more time to get to know the visiting authors. Unlike a music Festival, we require a real focus from our audience, so the two festivals really help people to stay focused and get as much as possible out of each event. These days it really feels like we run a spring season and a fall season — it’s so much more than just the festivals, we’re going all the time. And best of all, the audiences just keep growing. I’m so grateful to this city for supporting what we do. It wouldn’t matter how hard we worked or what we brought to town if there wasn’t such amazing community support. It’s the city that drives the festival. It’s the city that keeps everything going. In a feature on the fall 2007 festival, Ottawa X-Press‘s Jeremy Mesiano-Crookston wrote: “Working slowly but surely like missionaries from some new world, they’re finally starting to reap the rewards: larger audiences that fill their room at the National Archives and spill out into the lobby, a growing staff of dedicated workers, and the resources and prestige that have started to attract some of the world’s biggest talents.” On top of this, the festival hosts the ongoing “Step into Stories” program, a series of writers reading in Ottawa-area public schools and annual readings for Ottawa’s John Newlove Poetry Award and Kenneth J. Harvey’s ReLit Awards as part of each fall’s festival program. Yeah, discovering John Lavery was a biggie for me personally and I think for many who got to know him through the festival. Apart from that it’s too hard to pin things down. We’ve been blessed to showcase whole generations of great writing — Yann Martel was here long before the wider world caught on to what he was doing. It was quite a thrill getting a shout-out from him when he won the Booker. David Gilmour was a regular long before his current success… the list goes on and on. Madelein Thien, Catherine Bush, Andrew Pyper, Annabel Lyon — we’ve been ahead of the curve on a lot of amazing writers. But really there’s just too many great discoveries to name. That’s a Sophie’s Choice question and I just can’t choose! I do think we’ve been a part of Ottawa’s rising prominence in world literature. In the early days reporters used to ask if we were worried about running out of local talent to celebrate from year to year and that question doesn’t get asked anymore: people finally see what amazing talent we’ve got in this town. I’ve always programmed without a quota system and we’ve always needed to showcase local talent based on a mandate of celebrating excellence, so that says something about the quality of writers in Ottawa for sure. We’ve also been able to show publishers and authors what a great place this is to connect with an audience hungry for great writing — and that’s led to a huge increase in authors visiting the city. It’s interesting how things came together this fall: the majority of the non-fiction programming falls outside the festival proper, so we’re just jammed with amazing fiction for the festival itself with just enough poetry and non-fiction in the mix to keep things diverse. It’s a great fall for novels. So many stellar books out this season that we had to decline more worthy authors than ever before (which is the WORST part of the job. I just hate falling in love with a book and not being able to find a spot for it!). So everything we are presenting is just top notch. I think this fall really makes the case that fiction is as effective (maybe even more so) than non-fiction is in providing insight into the world around us. The festival is where I go to get a sense of where we are and how we got here and this fall will deliver the insight in spades! The other big thing this fall is a surge in musical events. Thanks to support from Celebrate Ontario, we’ve got some stellar music this year: Alan Neil’s Songwriting Circle, the Shostakovich event with Music and Beyond and our Marshall McLuhan event to name just three. Those are going to be a lot of fun! Also hugely excited about the Scottish Crime night… hell, I’m excited about everything. Guy Vanderhaeghe‘s new book is mind-blowing. Loved the Anne Enright and David Gilmour books. Huge fan of David Bezmozgis and Sheila Heti and Anita Rau Badami and Miriam Toews. Thrilled to have Patrick Lane, David McGimpsey, Dionne Brand and Sandra Ridley back on the stage. But again, this is Sophie’s Choice territory — there’s too much great stuff to narrow things down to just a few highlights. I guess the other thing I want to say is how grateful I am to Kira and Leslie — me and Neil are always in the limelight, but it’s Les and Kira who really keep things moving. We’ve got a tiny staff compared to pretty much all our peers, and do a heck of a lot more with less. That would not and could not happen if they didn’t work so hard and so well — all our success is really thanks to those two and to our amazing volunteers and festival members.